UNU-MERIT » SDG+1: How Much Will the Health Goal Cost to Achieve? SDG+1: How Much Will the Health Goal Cost to Achieve? We are now fast approaching the first anniversary of the UN Sustainable Development Goals (SDGs) – “a plan of action for people, planet and prosperity” – adopted 25 September 2015. In the run-up to the anniversary, this series will focus on various aspects of a new monitoring tool designed to measure impact and hold governments to account. With 17 goals and 169 targets, the Sustainable Development Goals (SDGs) are much broader and more comprehensive than their predecessors, the Millennium Development Goals (MDGs). Health is one of the core elements in human capital development and is explicitly presented under Goal 3, which aims to “Ensure healthy lives and promote well-being for all at all ages”. This goal is far more inclusive than its predecessor and seeks to put the issue high up on the 2030 Agenda. Goal 3 has nine targets and 14 indicators, combining components of the MDGs that focused on reducing child mortality, maternal mortality and the epidemics of AIDS, tuberculosis and malaria. New targets also aim to reduce non-communicable or lifestyle diseases, which are among the main causes of premature deaths, and promote mental health in both developed and developing countries. When considering targets, it is also important to understand fiscal capacity. This underpins the potential mechanisms for implementing the social, economic and environmental agenda of the SDGs in general and the health-related goal in particular. Previous efforts have shown that designing a monitoring framework for estimating the potential costs to meet global commitments is not an impossible task. For example, Honorary Professor Michael Cichon , PhD fellows and Master students from UNU-MERIT developed a Social Protection Floor Index (SPFI). This estimates the financial resources required to guarantee access to essential healthcare, based on the economic capacity of the country in question. A similar estimate for the SDGs would require a careful examination of the types of targets: to assess the achievement of the Goals and to establish a monitoring tool for their implementation. In this regard, I and four other PhD Fellows authored a working paper, The Affordability of the Sustainable Development Goals: A myth or Reality? For this paper, we developed a monitoring tool to estimate the resources required to implement the social development targets of the SDGs. Along with the income and education gap indicators, we developed a three-step approach to assess the normative public health expenditure gap – the staff expenditure gap and the resource allocation gap. The highest score is then considered as an indicator for the health resource gap that needs to be covered to achieve the health-specific targets in the SDGs (see Table 1). For the analysis, our study selected 11 low and middle income countries that have already achieved targets under Goal 3, specifically 3.1, 3.2, 3.7 and 3.8. The indicators used in the first two targets have been well established since the MDGs: reduce the maternal mortality rate to less than 70 per 100,000 live births, the neonatal mortality rate to 12 per 1,000 live births, and the under-5 mortality rate to 25 per 1,000 live births. The other two targets in the SDGs are: achieve universal access to sexual and reproductive healthcare services, and achieve universal health coverage. In our approach, we first calculate the normative public health expenditure gap, i.e., where public expenditure on health is smaller than or equal to the benchmark. Second, the staffing expenditure gap is one of the key criteria that determine whether a country has the capacity to provide healthcare services to society. According to a report by the World Health Organisation published in 2006, the health workforce drives on average 42.2% of all governmental health expenditure globally. Hence, the number of staff members per 1,000 people and the expenditure made on them indicates whether countries have adequate staffing members in place to achieve the desired health outcomes. Lastly, we estimate effectiveness in terms of resource allocation in the health sector by looking at the percentage of births attended by skilled staff as a proxy for the adequate allocation of resources. To clarify the need for multiple monitoring instruments to capture the resource requirement for attaining national and global commitments, such as the SDGs, I will focus on the low-income and lower middle-income countries in Africa, Asia and Latin America that are analysed in our study. As presented in Table 1, the public health expenditure gap is lower in Ethiopia (0.77% of GDP) than in Senegal (1.22% of GDP), which in turn is lower than in Indonesia (2.56% of GDP). The story is completely the opposite when we look at the other two indicators (gaps in health staff expenditure and resource allocation): Indonesia has lower health staff and allocation gaps followed by Senegal and Ethiopia. This is a clear indication that aggregate spending in the health sector could not shed light on the entire dimensions of health security in a given country. Making significant expenditure in the construction and maintenance of health facilities is necessary but not sufficient. Staffing these facilities with the appropriate personnel and providing the required medical supplies should also be done simultaneously. All national and global development targets and goals require human, physical, financial and time resources to be achieved. 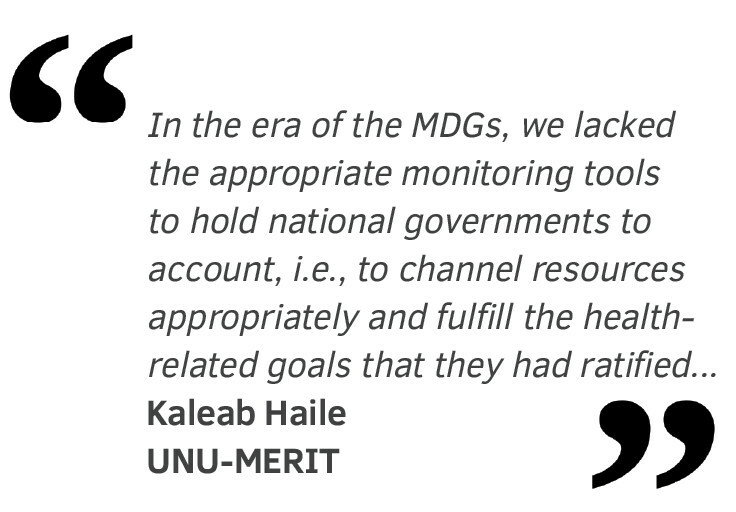 In the era of the MDGs, we lacked the appropriate monitoring tools to hold national governments to account, i.e., to channel resources appropriately and fulfill the health-related goals that they had ratified. Without such tools, the current ambitious 2030 Development Agenda may also be wrongly interpreted as a simple extension of the previous deadlines; which could go on and on for the coming future global development commitments. To ensure achievement of Goal 3 by 2030, the monitoring tools should therefore be: (i) broad enough to capture all the targets (ii) accommodate country specific requirements, and (iii) signal national capacities. 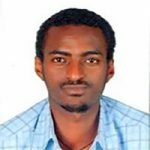 Kaleab Kebede Haile is a PhD fellow whose research considers the transformation of smallholder agriculture into climate-resilient production systems.